President Vladimir Putin delivers a speech at the Russian Energy Week 2017 forum in Moscow, Russia October 4, 2017. MOSCOW - President Vladimir Putin said on Wednesday that ties with U.S. President Donald Trump’s administration were not without problems, but he hoped that mutual interests of Russia and the United States in fighting terrorism would help improve Moscow’s relations with Washington. 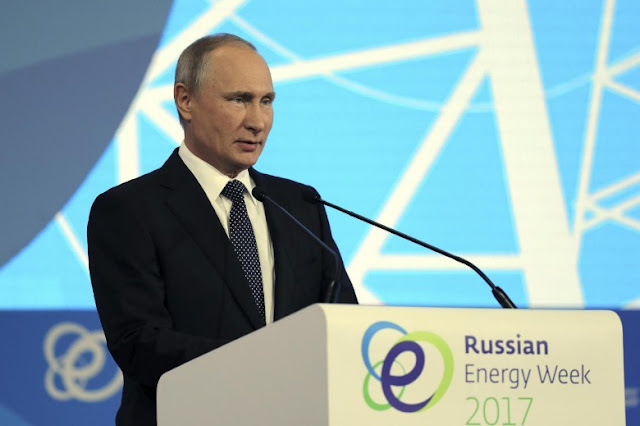 “Some forces are making use of Russian-American relations to resolve internal political problems in the United States,” Putin told an energy forum in Moscow. Moscow has “lots of friends” in the United States who genuinely want to improve relations with Russia, Putin added. President Vladimir Putin said on Wednesday that ties with U.S. President Donald Trump’s administration were not without problems, but he hoped that mutual interests of Russia and the United States in fighting terrorism would help improve Moscow’s relations with Washington.